Ford 4th Generation PEPS . 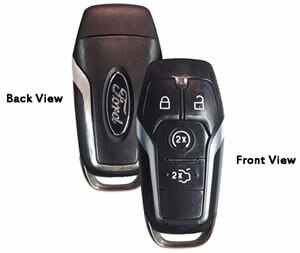 Ford and Lincoln are now using their fouth revision of pasive entry, passive start key fobs. for backup purposes. These are currently being used on the 2013 - 2014 Fusions, but look for them to be used on more models soon. Ford has tightened up the security protocall for programming replacement keys on this system. The electronic programming tool must communicate with Ford Motor Company's service mainframe computer in order to match replacement fobs to a vehicle. This provides an audit trail that can be accessed by the NICB (national insurance crime bureau) in the event a vehicle is stolen, consisting of the technicians name, SDRM registration ID, date of service, number of fobs programmed, location, etc. We are licensed and registered to perform this service and have invested in the equipment to do this at a location that is convineint to you, rather than towing your vehicle to the Ford dealer for this service.